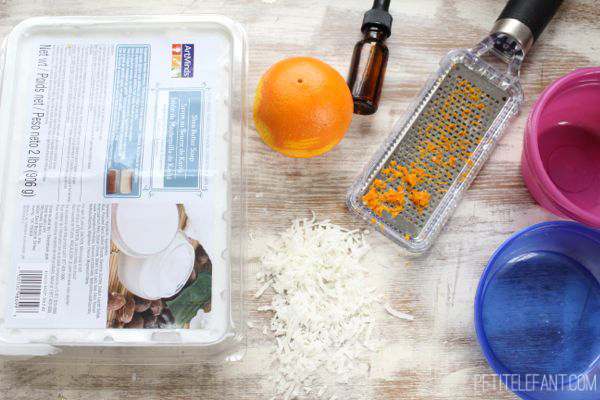 Making homemade soap is one of those crafts that sounds intimidating, doesn’t it? You picture yourself slaving over a stove, scorching your fingers pouring hot soap into tiny molds. But fear not! 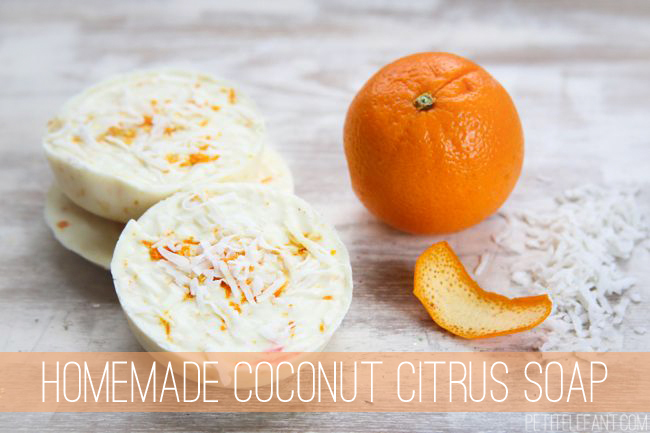 Homemade soap is actually one of the most insanely simple things to do at home. If you have a microwave, then you’re all set. No special equipment is required – not even tiny soap molds. 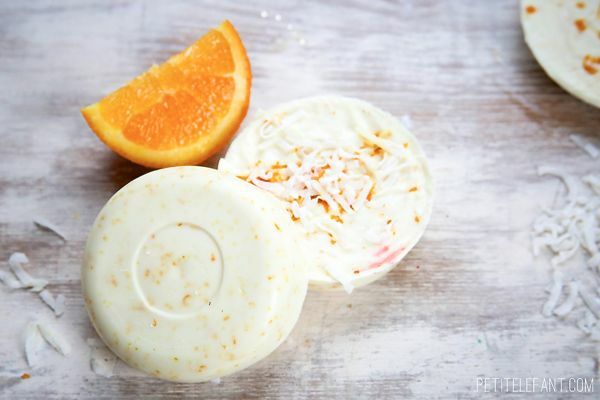 And if you like knowing what goes into your cleaning products, especially the ones you use on your skin, definitely give this homemade soap a try. Your hands will thank you! The fun part of making homemade soap is playing around with different recipes. You can take things you already have in your kitchen – like fresh herbs or citrus – to make all-natural scents. Adding fruit, like strawberries, would be fun too. And I like giving mine a bit of decadence by adding chocolate cocoa powder or shredded coconut. 1/3 of a block of shea butter soap base. This is available at most craft stores (mine came from Michael’s). They also make goat’s milk and olive oil soap bases. 1 tablespoon of citrus zest. 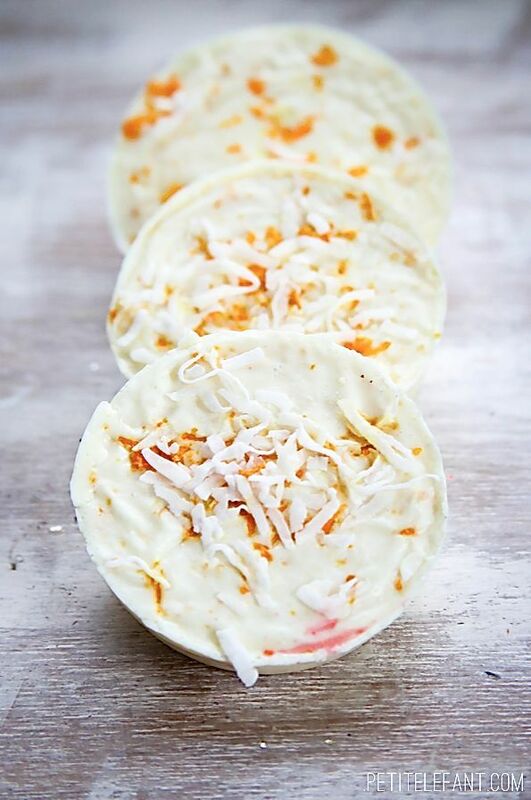 1-2 tablespoons of shredded coconut. 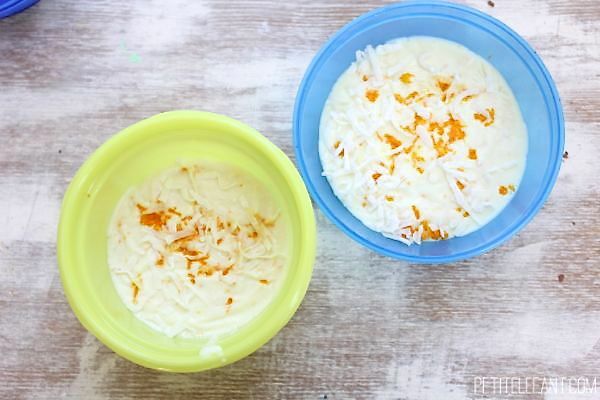 Melt the soap base in a microwave safe container (I like to use Pyrex measuring cups for easy pouring) in the microwave in 30 second intervals. When it’s completely melted, add the zest, essential oil and coconut. Mix together well and pour into a container. I used a few plastic bowls but you can also use empty milk cartons or other cardboard shapes you find in the recycling bin. Just make sure to wash them thoroughly before using. After pouring the soap into the mold, sprinkle more zest or coconut on top if desired. Let the soap harden for about an hour and then pop it out of the container. That’s it! I told you it was easy! What flavors would you use? 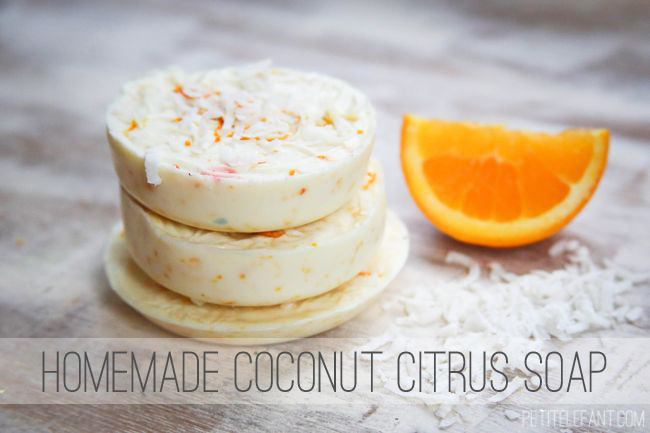 Have you ever tried making homemade soap? This looks lovely!! I don’t actually have a microwave – would it work to melt everything double-boiler-style? What a great idea! I’m so excited to try this! This is such a beautiful combination of scents! Would I need to add preservatives since there is food in the recipe? Thanks for your post. Oranges are very good for our health. This is my favourite fruit and the smell of oranges is very nice. I am excited to try this too! I have recently discovered all of the terrible things that are in most soaps so I am determined to go organic. This approach seems much easier than using lye. Talk about being intimidated! I was thinking about doing different scents including coffee or oatmeal. Would these work just fine and are there any scents you would recommend to compliment them? MMM that looks delicious/AMAZING! Gotta try… thanks! this sounds so good , but I would rather make it from scratch then from melt and pour. I’s the coconut there to exfoliate or is it just for scent purposes? Thanks for sharing. Yes, I’ve made soap using the type mentioned here from Michael’s. It was ok, but felt like wax was on my skin after I used it. I still have an Olive Oil soap back left, might try this. Is there any other way to make a SAFE soap with using lye?